A worn-out robot? Check! Getting deserted on a trashy planet? Check! Hitting super sonic speed? DOUBLE CHECK! In this review, we examine if Freshly Squeezed’s Defunct has enough juice to reach the finish line! 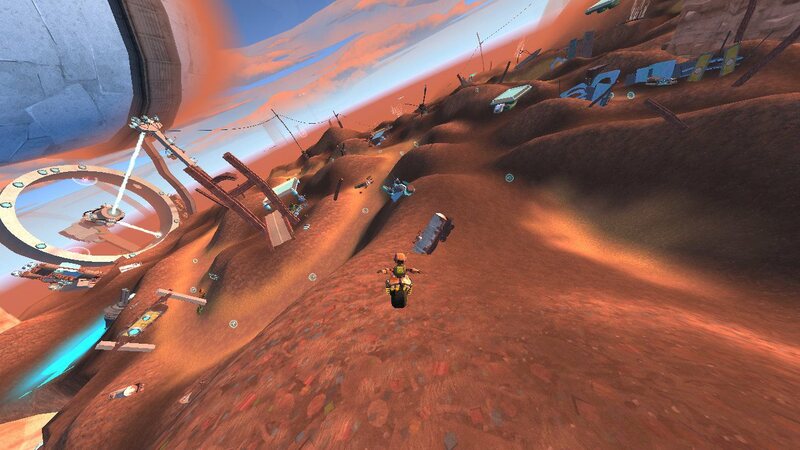 Defunct follows the tale of a robot that gets marooned on a trashy planet. Like many modern Sonic games, players travel across linear levels while avoiding obstacles and going fast. Going fast, however, is a little challenging for the robot in question – as its motor gets broken early on. You can still move forward with the ‘A’ button, but the robot will only move at the speed of a turtle. 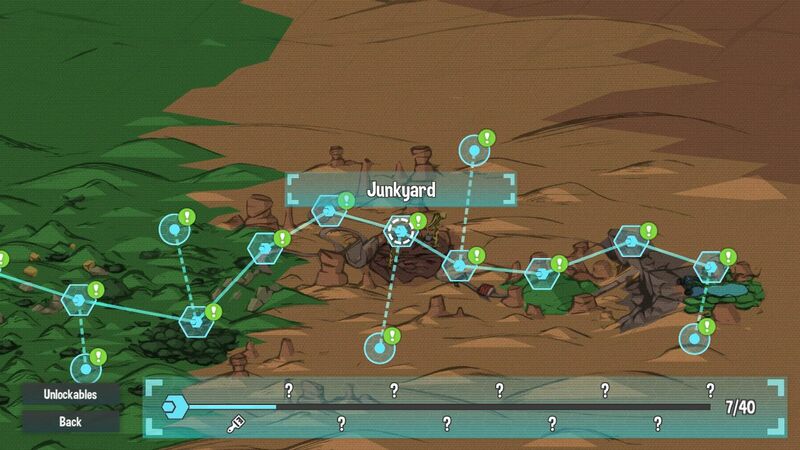 Stray ‘scrap’ items can be collected to speed up momentarily, but you’ll grind to a halt mere seconds after that. This is where the ‘Gravitize’ ability comes in handy, instead. 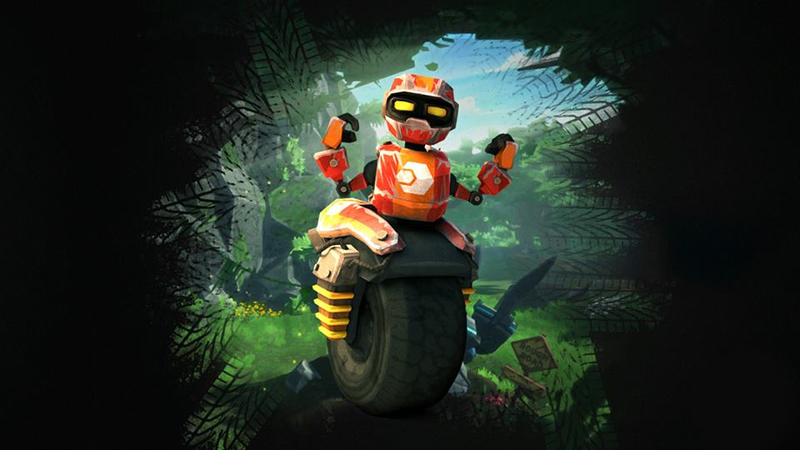 By pressing the ‘ZR’ trigger on downhill slopes, the robot will slide downwards at insane speeds – thereby accelerating forward. 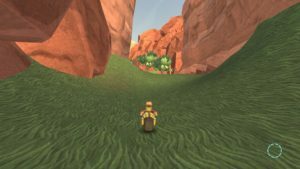 This is the game’s core mechanic – and it can be a little tricky to master at first, as spamming it on uphill slopes will slow you down instead. You will need a good sense of rhythm and precise timing to speed up constantly over multiple hills. Some levels can get pretty fun and challenging with the gravity mechanic. You’ll encounter bounce-pads that launch you sky-high when you ‘Gravitize’ on them, wall-running sections which require you to build up speed, and crazy loop-the-loops. Several sections of the map are also wide open, so you’ll get an opportunity to play around with the game’s physics. 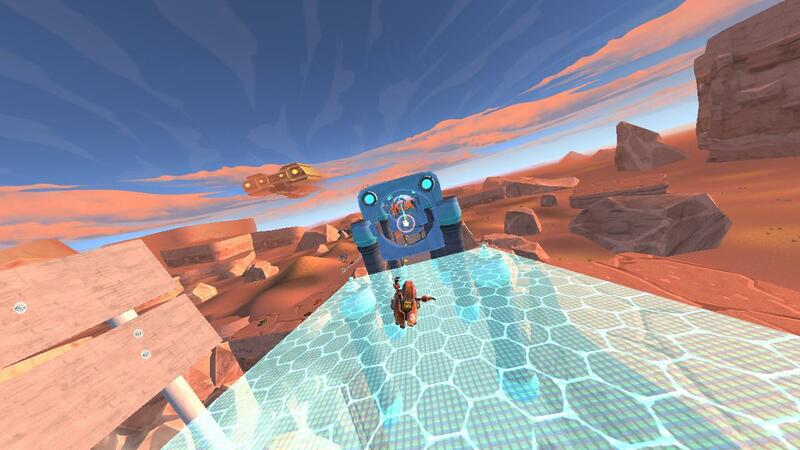 While a little experimental, Defunct offers something fresh for the platforming genre. Once you get good at using slopes, Defunct really starts to shine. 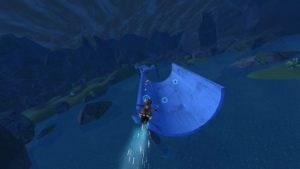 Flying off ramps and curved walls by your own effort is an amazing rush. You’ll feel like a bonafide daredevil as you whiz past junkyards, lush forests, and barren deserts. The game even allows you to perform tricks in mid-air just for the heck of it. You can also replay most levels in ‘time trial’ mode – which ranks you with players worldwide. While optional, it was fun to revisit levels and discover faster pathways that I had missed the first time. There’s an added sense of adrenaline and tension when you pit yourself against the clock. Additionally, there are a couple of special tokens to grab in each level. These optional objectives are usually hidden out of the way, so you’ll have to do some searching or crazy stunts to reach them. You only get alternate skins for the robot by collecting them, however – so I don’t think many players will be bothered to hunt them down. 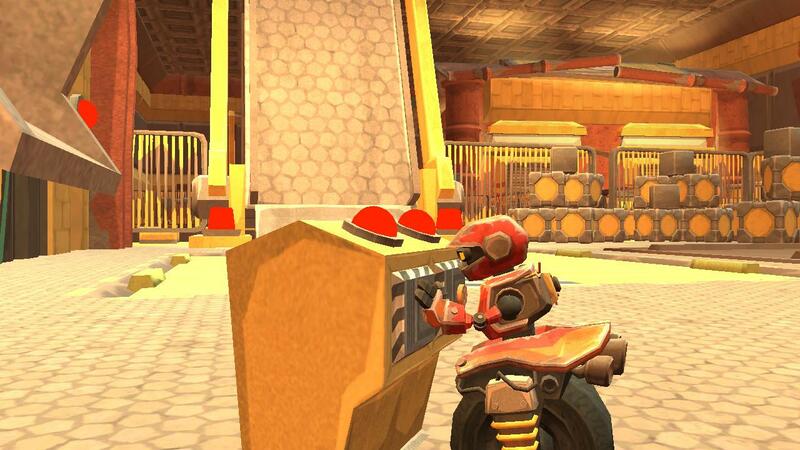 Overall, Defunct carves out its own niche in the platforming genre. 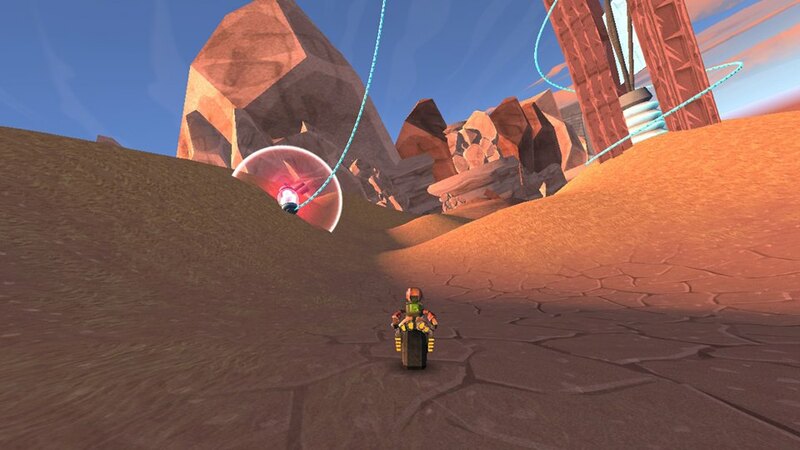 It’s certainly not a Sonic-clone, although it does try to achieve the same experience with time trials. The game’s unique gravity mechanic really sets it apart from other physics-based games, and there’s a sense of pure bliss when it finally clicks for you. Visually, Defunct sports a more cartoon-like, almost cel-shaded look – which can be a double-edged sword. While obstacles and ramps are generally easier to spot with the use of brighter colors, some ground textures and objects can also feel flat and lifeless. There were definitely a number of times when I was taken out of the experience by grassy plains which looked like they belonged in a Nintendo 64 game. Fortunately, the game’s developers seem to have kept such nitpicks in mind. I highly recommend trying out the ‘Quality’ setting once in awhile, as it adds an amazing speed blur effect that warps the world around the corners of your screen (see the screenshot above). Additionally, using the ‘Quality’ setting makes environments like jungles look livelier – with added foliage and object details. I was initially set on giving Defunct a lower score, but the boost in visuals here was impressive enough for me to bump it up a notch. Overall, It’s really cool that Defunct’s porting team considered the versatility of the Switch hardware. While it’s a shame that portable players can only use ‘Performance’ mode, the developers definitely worked hard to optimize the experience regardless of how you play. Defunct really surprised me in this department. Defunct is not without its issues, however. The game costs $14.99 – but even that can feel a little pricey for the base experience. By ignoring most of the special tokens and blazing through stages, I completed the main story within just two hours. 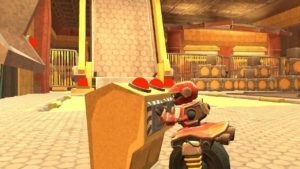 Replaying Defunct to collect tokens and beat time trials is not really a value-add – it’s pretty much the main value of the game due its short tenure. Also, hunting down special tokens REALLY pads out the game’s length – but not necessarily in the best way. Many of them are placed in hard-to-reach locations – so you’ll soon find yourself rolling back and forth in your attempts to grab them. This kind of trial-and-error gameplay can become frustrating due to Defunct’s looser physics, and it neutered my sense of momentum quite often. If you’re obsessed about completing games 100%, Defunct can end up being a dream or nightmare for you. Also, a lot of the earlier levels don’t facilitate ‘going fast’ that well. Most of them have annoying uphill climbs that took forever to overcome, and it felt like the game was actively discouraging me from having fun. I get that these were probably introductory stages, but it felt like players could have been given more opportunities to have fun a little earlier. Even after Defunct starts getting good somewhere in the middle, the fun doesn’t last for long. Just when I had mastered the game’s mechanics, Defunct’s story abruptly ended and the credits rolled. I was literally scratching my head and asking “That was it?” in bewilderment. I was indeed having loads of fun with Defunct – which only made it more painful when the game concluded so unexpectedly. Despite some rough edges, Defunct is anything but dysfunctional. Like its robotic main character, it’s a surprisingly competent game hiding underneath a roughed-up shell. All in all, the game is a very novel experience with a simple presentation – and it doesn’t try to distract players with some ‘deep’ story like many indie games. 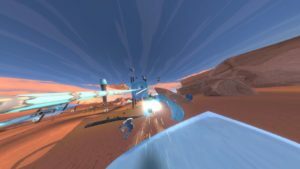 Defunct is just about mastering pure speed with a little creativity, and it’s not afraid to have some fun in the process. A few nitpicks (like the game’s length and frustrating early levels) may turn off some players. 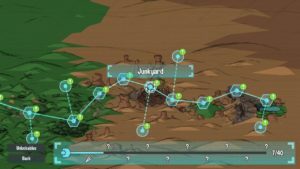 I can’t deny that I felt annoyed with the first third of the game – which came across as monotonous and slightly lifeless. However, Defunct gradually matured like fine wine as I mastered its unique controls and revisited levels with my improved skills. I highly encourage anyone interested in the game to stick with it for as long as possible. Even if it starts slow, you’ll eventually be having fun faster than you can imagine. Speeding through the air is exhilarating, once you master the controls. 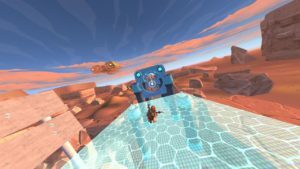 Time trials offer an actual challenge. Different display settings make the game look great in docked mode. The first few levels are tedious to get through. The game is quite short. Hunting down tokens can kill the momentum of the fast gameplay. VERDICT: This soup is a rush of good flavors…if you take enough time to savor it all. 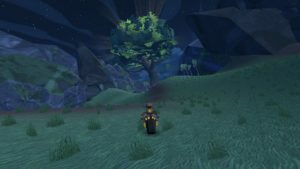 A review code for Defunct was provided for the purpose of this review by Soedesco and Freshly Squeezed.